I first met Jamie when she rented a station from me at Salon Paisley in Sacramento. I loved getting to know this sweet lady, and had so much fun working with her over the years. She even managed to convince me to try out her spin class at Team-Ride, and I seriously LOVED it! Anyhow... Now her and her husband have a sweet baby boy who just turned 1 and they needed some family photos done. I can't even begin to tell you how excited I was to be the one to take them! I'm so grateful that they made the trip up to Fort Bragg for photos and that we got to spend the weekend catching up too! It was tough leaving so many of our friends when we decided to make the move back up to the Mendocino coast, and I am so happy when I can reconnect with them! 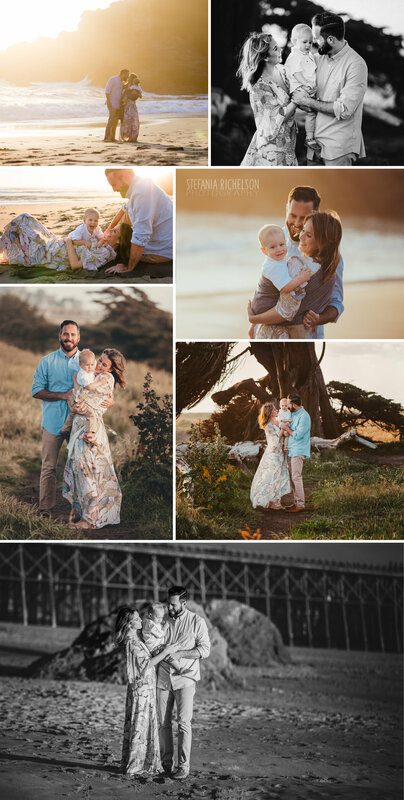 Here's a little share from their amazing sunset session at Pudding Creek Beach.